"May malungkot tayong balita. At 7:25 this morning, 'yung volunteer divers natin nakita ang fuselage. May mga katawan sa loob pero 'di nila talaga ma-identify. Nung nakalapit sila at about 7:45 am, may mga indications na isa doon sa mga katawan sa loob ng fuselage ay kay Sec Robredo. At that was at about 7:45 (am)," Transport Secretary Mar Roxas said in a press briefing shortly after 9 a.m. Tuesday in Masbate City. Robredo, Bahinting, and Chand went missing after their Piper Seneca plane plunged into the waters off Masbate City, just a few hundred meters short of the Moises Espinosa Airport in the city. A fourth passenger, Jun Abrasado, Robredo's aide-de-camp, survived the crash. He was rescued by local fishermen moments after the crash. The plane, coming from Cebu's Mactan International Airport, was on its way to Naga City when it encountered engine trouble. The plane was attempting an emergency landing when it crashed into the waters of Masbate Pass, between Masbate and Ticao islands. The DILG chief was on his way home to Naga for the long weekend. 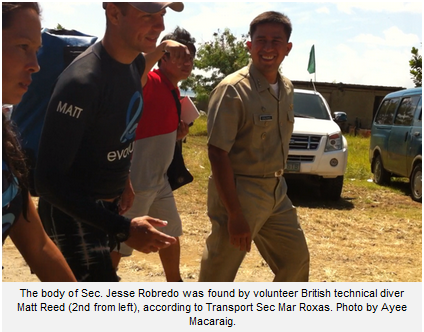 Matt Reed, a volunteer British technical diver, was the one who saw Robredo's body underwater, said Roxas. Robredo's body was found in the cabin of the plane; he was the first to be receovered and brought to land. At least one other body was seen in the cockpit area, Roxas added. Robredo's body was immediately brought to a coast guard vessel. As of posting at 10 am, the body is now at Las Internas funeral parlor in Masbate. Aquino, who is back in Manila, personally relayed the news to Robredo's widow Atty Leni Gerona-Robredo via a phone call at around 8:20 am, Roxas said. Roxas told Sarah Bahinting, daughter of pilot Jesse Bahinting, who is also in Masbate: "I'm sorry for your loss." They are seeking the help of the Army and Police forensics in handling the late secretary's remains, he added. The plane's fuselage was found 800m offshore, at a depth of 180 ft, Roxas told reporters.